16 June - 21 July 2012. Opening on 16 June, 18h. Ana Hoffner was born in 1980 in Yugoslavia. Since 1989 she has lived in Vienna. She completed her studies in Post-conceptual Practice at the University of Fine Arts in Vienna in 2007, currently working on her PhD in the PhD in Practice program at the Academy of Fine Arts Vienna. Ana Hoffner is a writer and performer who lives and works in Vienna, working in the fields of queer and migratory/ (post)colonial politics. In order to challenge the politics of marginalization in contemporary Europe, Ana Hoffner creates a performative practice that consists of re-enactments, interventions, lectures and workshops. She uses strategies of quotation, and specifically performance reenactments. She intones, reinterprets and re-politicizes performances from performance art history with personal discourse. That personal discourse is a part of political ‘testimony’ or confession about the subjectivity of the artist who identifies through queer and migrant politics. I’m Too Sad to Tell You, Bosnian Girl is a re-enactment that re-contextualizes two artworks, a video performance from Bas Jan Ader and a photograph from Sejla Kameric. The lecture performance investigates the practice of self-reflection and challenges the model of civilization and security. The precondition for successful self-reflection is considered as its failure at the point at which all human existence is defined: it is the nonhuman, which is blamed for transforming the civilizing model of space-time into a zone of barbarism, underdevelopment, and uncontrolled affect. Through the re-enactment of Bruce Nauman’s Walking in an Exaggerated Manner in the Perimeters of a Square in the work Movement, privatized another attempt is undertaken to re-articulate the relationship of body and space for the present time. 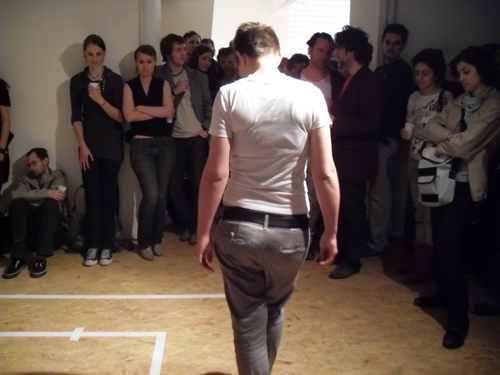 Nauman’s movement takes place with direct involvement of the audience when it surprisingly turns to Oleg Kulik’s performing as a dog and approaches questions of migration and queer bodies in post-Fordist society. square takes place within the closed boundaries of his studio and is only accessible for the audience through the medium. In the form of a re-enactment of this work from the 1968, the attempt is undertaken to re-articulate the relationship of body and space for the present time. This time, Nauman’s movement takes place with direct involvement of the audience and approaches questions that are shifted off into a depolitized private area. The square is symbolic of a system that makes any social movement impossible through privatisation. Using the example of sexual-political movements that are absorbed in neo-liberal capitalism and brought to a standstill, it becomes visible how a self-explained capitalist and hetero-normative centre overspills its edges and undermines possibilities of opposition. Inside and outside, but also public and private disappear in this process in an indistinguishability, in which there is only a tranquilised private anymore. Characteristic of this state is the creation of a naked life which in its invisibility cannot access any form of identity politics that constitutes the basis of social movement. Movement, Privatized tries to draw attention to possibilities of action within this invisibility, particularly because these have not yet been assigned to the political sphere. From this position, it is necessary to ask for forms of the public beyond the identity-political model of representation. The script of the performance is available online at <http://www.reartikulacija.org/?p=628> in REARTIKULACIJA #8, 2009.